On July 8th, Rebel Leader John Garang was waving to a crowd of more than one million Sudanese who gathered in the capital of Khartoum to welcome the new Vice President of Sudan back home after a 21 year hiatus. Today John Garang is dead! 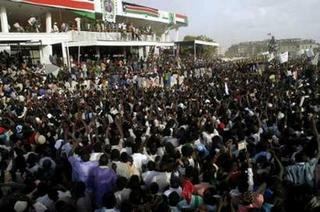 More than a million Sudanese greeted John Garang in Khartoum’s Green Square on July 8th. Garang was considered a hero for peace by many of the suffering Sudanese people. Reports at dawn on Monday indicate that New Sudan’s First Vice President John Garang died when a Ugandan military helicopter he was travelling in crashed on Saturday night. Ugandan authorities lost contact with the helicopter carrying him to Juba, after a weekend meeting with President Yoweri Museveni. The Ugandan military last night could only say that they had located a signal of the presidential helicopter carrying Colonel Garang after it lost contact in bad weather, at a spot on the border between Uganda and Sudan. However, they were yet to reach the site. US Secretary of State Condoleezza Rice met with Vice President Garang on her trip to Sudan on July 21, 2005. In a statement quoted by state television, it said Garang, six of his companions and a crew of seven had died. “The march of peace will continue toward its goal and his death will only make us stronger and more determined to complete the march which he began and his companions began,” it added. On Sunday there were reports that his plane had landed safely, according to Sudanese state television. Garang’s absence would be a heavy blow to the January peace deal that ended a 21-year civil war between the mostly Muslim north and the Christian and animist south in which some 2 million people died. For the latest on the ‘New’ Sudan Crisis go to this post.